We specialize in spray foam roofing services to protect your residential or commercial roof. Spray foam is an acrylic elastomer water base formulated to protect new foam roofs. It is a proven way of recoating over existing foam roofs and previously coated roofing substrates. We use spray foam roof coatings on our client’s roofs because it improves the value and longevity of their property’s insulation. Your roof is one of the most important aspects of your property and it’s crucial to make sure it’s properly insulated. Spray foam can be used on many different types of roofs and we even offer warranties on our work. 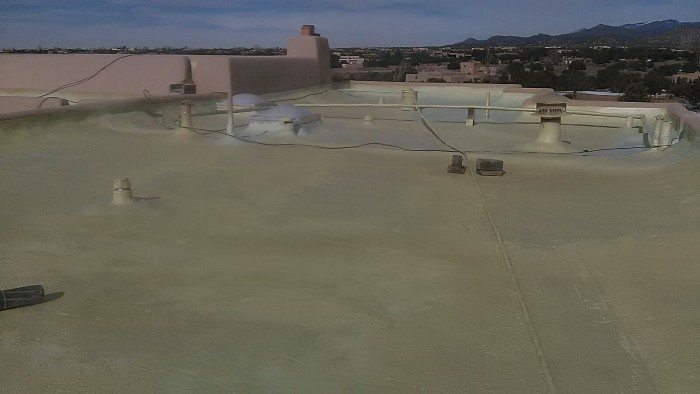 We specialize in spray foam roof coating for clients in Santa Fe, Taos, Los Alamos, Farmington, Tesuque, White Rock, Hobbs, Española.